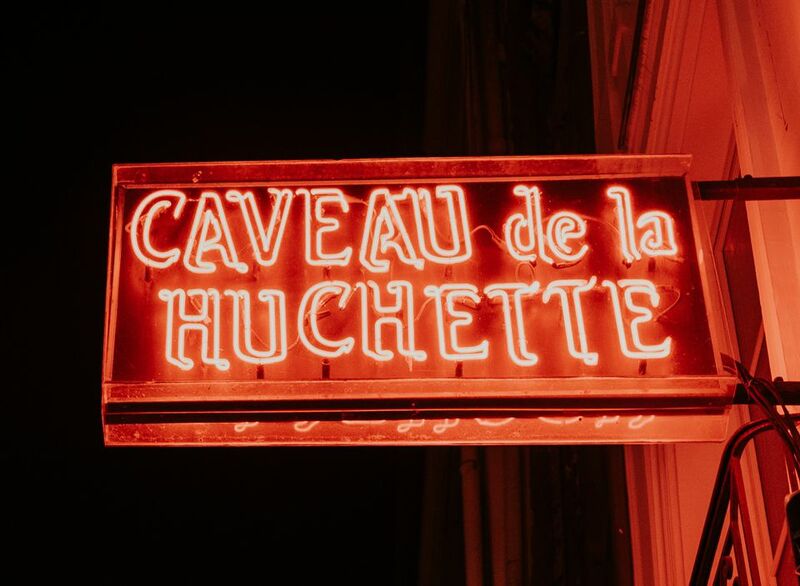 Le Caveau de la Huchette is a legendary jazz, swing and blues club in the French capital. But rather than being a rather washed-out symbol of a lost golden era, it continues to loom large in popular culture's romantic image of Parisian nightlife. Case in point: it makes a prominent appearance in the 2016 Oscar-winning movie "La La Land," with Ryan Gosling's character playing piano in the club as an enthusiastic crowd takes to the dance floor. The Latin Quarter jazz and blues club, first opened in 1946, has seen something of a revival ever since its recent Hollywood cameo, succeeding in attracting ever-younger crowds for live music and dancing on weekend nights. But long before it was associated with Gosling and Emma Stone, it offered a stage for greats including Count Basie, Art Blakey, Georges Brassens, Sidney Bechet and many others. Read on to learn why to consider a nightcap at this iconic spot on your next visit, whether for some jazzy inspiration, drinks, dancing — or all of the above. The club is housed in a building dating to the 16th century. The owners claim the premises were once used by masonic cults as a secret lodge. First opened as "Le Caveau de la Terreur" (The Cave of Terror), the club became a popular spot for jazz orchestras and intimate performances from up-and-coming singers. It was here that jazz, blues and swing performers including Art Blakey and his Jazz Messengers, Jean-Paul Amouroux, Ronald Baker, Gianni Basso, Claude Bolling and many others captured new audiences and saw their careers take off. The bar reputedly inspired Alan Sytner to open a club in Liverpool, The Cavern, that would catapult to fame as a place where The Beatles gave some of their first performances. Since the 1970s, Le Caveau de la Huchette has been helmed by Dany Doriz, a vibraphonist and friend to legendary American jazz artist Lionel Hampton. The latter frequently played at the club during its heyday in the mid-20th century. The club stages concerts every night of the week, with shows starting at 9:30 p.m. nightly. You can see the full program here (in French only). Performances from international jazz, swing and blues artists make up most of the program at the bar. Tickets currently range from around 13 to 15 euros, but prices may change at any time. Reservations are not accepted at this club. Simply show up at 9:00 pm when the bar opens, to make sure you can secure a spot inside for the show. Payment with cash is recommended. Inside, the ambience is fitting of a classic Parisian jazz club, with windowless stone walls, deep leather booths in red, low lights and ornate, old-fashioned lamps. You'd be forgiven for believing you'd been transported back in time to the elegant late 1940s just by stepping through the doors at the iconic club. You aren't required to purchase drinks at the bar if you've paid for a show, but they're available for purchase. Wine, beer, champagne and cocktails are available, as well as non-alcoholic drinks. Food is not served at this bar. Dancing at this iconic address is (nearly) obligatory, especially on nights when live swing and orchestral jazz fill the air in the "cave." Casual dress is fine, but you may wish to dress up a bit to fully enjoy the throwback experience. The Caveau de la Huchette is situated in the 5th arrondissement of Paris, in close reach of the Seine River on Paris' left bank (rive gauche). It's just south of the Notre-Dame Cathedral on the other side of the river, and a short walk away from the Saint-Michel Metro and RER Commuter train stop. You can also get off at the Cité Metro stop near Notre Dame and cross the river to reach the club. Situated at the heart of the Latin Quarter, Le Caveau makes an excellent nightcap after exploring the surrounding neighborhood and its numerous attractions. Wander through the narrow, cobbled streets of the Latin Quarter, stopping to admire iconic sites such as the centuries-old Sorbonne University, the Pantheon, the Place de la Contrescarpe, the legendary Shakespeare and Company bookstore and the banks of the Seine near St-Michel. Take a break and perhaps stage a picnic at the leafy Jardin du Luxembourg, where elegant, tree-lined lanes, statues, ponds and ornate flower beds are best appreciated on a sunny day. If it's a rainy day, duck into one of the area's many charming old cinemas for a double feature, or enjoy a cafe creme inside a warm cafe-brasserie on Boulevard St-Michel. We also recommend the medieval art collections and mysterious Flemish tapestries at the Musée Cluny, as well as taking a peek at the nearby Roman arena of Lutèce: a striking, rare vestige from the period when Paris was Lutecia, part of the Roman Empire.